Looking for that crucial extra space in your Dartford premises? Build mezzanine flooring! There's no more cost effective or ideal way of creating additional floor space than by having mezzanine flooring installed. As one of Kent and London's leading storage specialists, we have designed, supplied and installed a multitude of mezzanine floors for clients across Dartford. So why not utilise our experience and buying power and order some mezzanine flooring for your business? Contact us for a free location visit, design and industrial mezzanine flooring quotation. Our industrial mezzanine flooring team will oversee your project from start to finish; from the initial quotation right through to the fabrication and installation and then the management of all aspects of building regulation approval. Included in your package when you purchase some new mezzanine flooring from us is a full project management service. From the very beginning of the project, right through to completion, we will take care of absolutely everything for you. Before we do anything, we'll start with a full no obligation survey to determine what is possible in your current set-up and what the best mezzanine flooring option would be for your needs. We will then provide full design and layout solutions that include full CAD design. This will give you a great idea of what your new mezzanine flooring would look like. Following this, we will take care of all planning, building and safety regulations to ensure that your new industrial or commercial mezzanine flooring correctly conforms to legislation. 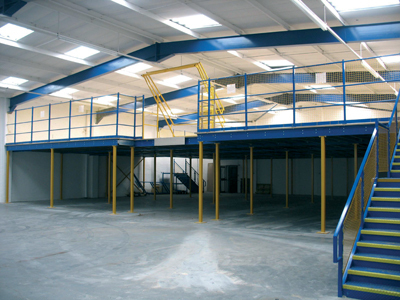 Lastly, we will install your new mezzanine floor to the highest possible quality standard. As one of Dartford's leading storage specialists, we will provide you with mezzanine flooring that's truly designed and tailored around your needs and specifications. Every one of our mezzanine floors is fully customisable, with swing arm pallet gates, staircases, glazing, safety barriers, up and over pallet gates, column casing, handrails, powder coated steel sections, partition walling and cat ladders fitted as and when required. As one of Kent and London's leading mezzanine flooring specialists, we will provide you with a raised storage area that fully meets your exact specification; with the consistently high quality of workmanship that we demand. All our industrial mezzanine floors are fully customisable with safety barriers, swing arm pallet gates, handrails, cat ladders, staircases, up and over pallet gates, glazing, powder coated steel sections, partition walling and column casing fitted as required. Should your storage project need it, we can also incorporate single and multi-tier floors, with a comprehensive choice of flooring, warehouse lighting and suspended ceilings. 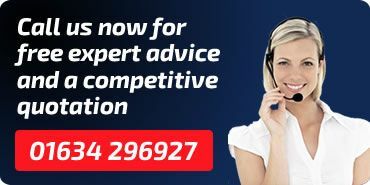 For advice and a no-obligation quotation, contact our industrial mezzanine flooring team on 01634 226530. Full CAD design service including weight load calculations and safety compliance. Manufactured to your exact specification, guaranteeing a high quality, durable floor that maximises the space you have available. Fitted by our team of professional industrial mezzanine floor installers, with minimal disruption to your business. We manage all building regulations, fire proofing and safety compliance. We can also supply additional new and used pallet racking and shelving or re-configure your existing racking to incorporate your new raised floor area.